Honeymoon is a precious phase of one’s life. For the most special time of your life, Indian Holiday presents a well-crafted Darjeeling Gangtok honeymoon package. Weave the most lovable moments with your partner while you explore North East India, one of the most beautiful regions in the world. Our 6 Nights 7 Days Darjeeling Gangtok Honeymoon Package covers both of these beautiful hill stations of North East India. Walk through the beautiful tea gardens, enjoy time at serene lakes and visit Buddhist monasteries. Don’t wait anymore, grab each other’s hands and prepare for moments that you will cherish forever. Note: This is just a suggested itinerary indicative of what could be possible. We tailor holidays for your specific needs. Contact us if you want modifications so that we could tailor a holiday to suit your need for an unforgettable India tour. On reaching New Jalpaiguri Railway Station (70.3 km) / Bagdogra Airport (65.3 km) / Tenzing Norgay Bus Stand (61.9 km), meet our IHPL representative who assists while you take a transfer. Set at the foothills of the Himalayas, Darjeeling is a picturesque hill station, which attracts tourists from all over the world. The destination is best known for World Heritage Train, which has been declared a World Heritage Site by UNESCO. Enjoy the incredible sights of the Himalayas, pay homage at alluring monasteries and experience natural beauty at its best. Darjeeling is the best destination if you wish to spend some private time away from the hustle and bustle of cities. On reaching Darjeeling, check-in to the hotel. In the evening, go for a stroll around the mall or the local shopping area. Stay overnight at the hotel. Wake up early this morning and then head towards the Tiger Hill. Located at a distance of 11 km from Darjeeling, Tiger Hill is known to offer spectacular views of the Kanchenjunga peaks. Enjoy a sunrise like never before. As the sun rays fall on the peaks, you get to enjoy a perfect view. The highest point of Darjeeling, Tiger Hill is a great location if you wish to spend some quality time with your partner amid tranquility. The place is also considered an ideal location for activities like trekking and hiking. After enjoying a breathtaking sunrise, leave for Darjeeling. On your way back, visit attractions like Ghoom Monastery, Batasia Loop and War Memorial. 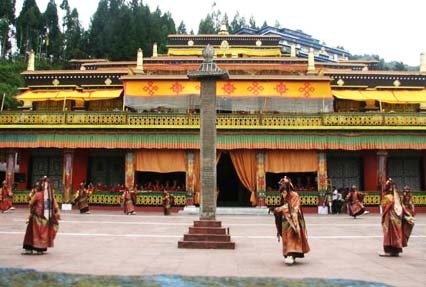 Pay homage to Maitreya Buddha at Ghoom Monastery. Also known as Yogachoeling Gompa, Ghoom Monastery is located in a place called Ghoom in Darjeeling. The Gompa was built back in the year 1875 and it houses a number of bells, ornate thanka scrolls and drums. War Memorial is located in the Batasia Loop Garden. The memorial was constructed to commemorate the Gorkha soldiers who lost their lives during wars and operations post independence. Batasia Loop is a popular tourist attraction of Darjeeling. It is the location from where the famous toy train of Darjeeling passes in a loop like pattern. Also, the place offers breathtaking views of the Himalayas. Enjoy some time close to nature with your partner and take back some great memories. On reaching back to the hotel, enjoy your breakfast and then leave for sightseeing. 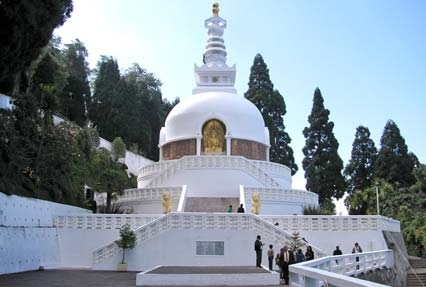 Your half day sightseeing tour includes visit to Padmaja Naidu Zoological Park, Himalayan Mountaineering Institute (Closed on Thursday), Ropeway, Tensing and Gombu Rock, Tibetan Refugee Self Help Center (Closed on Sunday), Tea Estate, Natural History Museum (Sunday Closed) and Peace Pagoda. Begin with a visit to Peace Pagoda. Peace Pagoda was set up to unite people of all castes and creeds. It aims to spread peace and prosperity in the world. The Pagoda displays four different avatars of Buddha, including that of Maitreya Buddha. Don’t miss visiting tea plantations when in Darjeeling. Walk through the tea plantations and get to learn about the entire tea processing. Cable car is another major tourist attraction of Darjeeling. 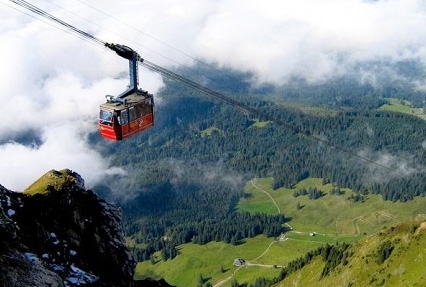 Enjoy spectacular views of snow-capped peaks, thick forests and green meadows from the cable car ride. Gather some special moments with your partner. Later, get back to the hotel. Evening is free for a stroll around the mall or Chowk Bazaar. Have a comfortable overnight stay at Darjeeling. Overnight stay in the hotel. On the 3rd day of your honeymoon trip, After having your breakfast this morning, leave for your full day excursion to Mirik. En-route, enjoy the captivating sights and capture some of them on camera. Set at an elevation of 1,495 m, Mirik is a destination, popular for its scenic beauty. The location of the place is perfect if you wish to relax and rejuvenate, away from the crowded cities. Covered by pine forests, Mirik allures nature lovers from all across the world. Sumendu Lake is the star attraction of Mirik. This serene lake is well-known for its tea gardens, cardamom groves and orchards. Walk by the lake and enjoy the spectacular views of the Himalayas with your beloved. Enjoy activities like boating and horse riding. On your way back to Darjeeling, visit the famous Pashupati Market and shop for some imported items like clothes and cosmetics. In the evening, go for a stroll around the hotel or local market area. Stay overnight at Darjeeling. This morning, you have your breakfast and then leave for your next destination, Gangtok. Around 97 km from Darjeeling, Gangtok is the capital of the state Sikkim and a popular tourist destination. Revered monasteries, beautiful gardens, pleasing weather, this destination has all what you need for a great holiday with your partner. The colorful ambience of the place is so alluring that it makes you come back again and again. Gangtok is also known as the land of monasteries because it houses a number of monasteries like Enchey Monastery, Rumtek Monastery and Do- Drul Chorten. The destination is a paradise for adventure lovers as it offers a number of activities like trekking and hiking. On reaching, check-in to the hotel. Go for a long walk around M G Road (Mall) and enjoy the soothing weather of the place. Stay overnight at Gangtok. On the 5th day of your Sikkim Darjeeling honeymoon trip, After having breakfast, and then leave for your Gangtok city tour. This city tour covers major destinations of Gangtok. Visit attractions like Enchey Monastery, Ganesh Tok, Directorate of Handicrafts & Handloom, Research Institute of Tibetology, Rumtek Monastery, Do Drul Chorten (Stupa), Flower Show, Hanuman Tok, Tashi View Point and Banjhakri Falls. Directorate of Handicrafts & Handloom is a government establishment which deserves a visit from every art lover. The place preserves traditional arts and handicrafts of Sikkim. Here you can shop for items like carved wooden handicrafts, woven blankets, shawls and more. One of the most revered places of worship in Gangtok, Enchey Monastery was set up back in the year 1909. It is believed that the location of the monastery was blessed by Lama Drupthob Karpo, who was an expert in a tantric art of Buddhism. Also, it is believed that protecting deities- Khangchendzonga and Yabdean reside in the monastery. The monastery also offers spectacular views of Mount Kanchenjunga. Do- drul Chorten Stupa is one of the biggest Stupas in Sikkim state. The architecture of the stupa is so intricate and beautiful, that it promises to leave every visitor mesmerized. One can find holy books and many other religious objects inside the stupa. 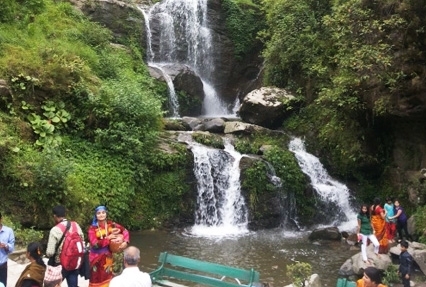 Banjhakri Falls is a major tourist attraction of Gangtok. The attraction is known for its scenic beauty and deserves a visit from all tourists traveling to Gangtok. Stairwells and beautiful sculptures add to the beauty of the place and make it more alluring. After sightseeing at all these attractions, head back to the hotel. In the evening, roam around the mall or the local shopping center of Gangtok. Experience the nightlife of Gangtok with a visit to any of its popular discotheques. Enjoy your breakfast and then leave for full day excursion to Baba Mandir and Tsomgo Lake. 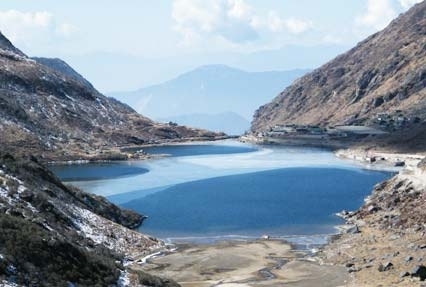 Set at a distance of around 39 km from Gangtok, Tsomgo Lake is a holy lake which is worshipped by Sikkimese. The beauty of the lake lies in its scenic and tranquil surroundings. There is a small temple dedicated to Lord Shiva built on the lake side. Tsomgo Lake is home to Brahmini ducks and many migratory birds. The picturesque location of the lake makes it perfect for some private time with your partner. Baba Mandir is a revered shrine, dedicated to Indian Army Soldier, Harbhajan Singh who died near Nathula Pass. It is believed that after his death, he appeared in the dreams of many soldiers and asked them to build a shrine in his memory. Also, it is believed that Harbhajan Singh is still ‘on-duty’ and he visits every night, puts on his uniform and goes for his rounds. Baba Harbhajan Singh is regarded as a saint to guards the lives of the soldiers posted on the borders. People believe that the shrine of Harbhajan Singh has magical powers and they visit from all over to seek the blessings of the soldier. There is also an option of visiting Nathula Pass. After this long excursion, head back to Gangtok. Go for a stroll around M G Road (Mall) or local shopping center in the evening. Stay overnight in Gangtok. 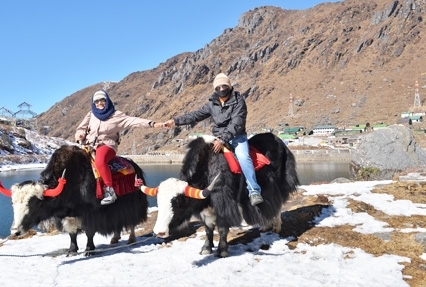 On the last day of your 7 days Darjeeling Gangtok honeymoon package. Have your breakfast and then leave for Siliguri / New Jalpaiguri Railway Station (119 km) / Bagdogra Airport (126 km) / Tenzing Norgay Bus Stand (113 km). On reaching, go for your onward journey.